Producer-writer-director Jamie Uys delivers awe-inspiring family entertainment in this unique look at the animal world. "...Footage that is sufficiently fascinating....Naïve charm..."
"...Vibrant....ANIMALS ARE BEAUTIFUL PEOPLE is especially fine family entertainment..."
Producer-writer-director Jamie Uys, who brought us the uproarious The Gods Must Be Crazy, delivers awe-inspiring family entertainment in this unique look at the animal world. Four years of production, one hundred thousand miles of travel and half a million feet of film went into this splendid production. 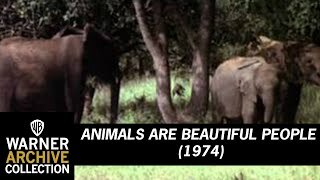 Narrated by Paddy O'Byrne, this video took nearly four years to create this beautiful study of wildlife. Humor is found in the fact that animals and humans often react in a similar manner.